Abstract: Ovarian anaplastic ependymoma is a rare gynecologic malignancy. Owing to its rarity, treatment is challenging. Unilateral ovarian ependymoma was found during laparoscopy in a 19-year-old woman. 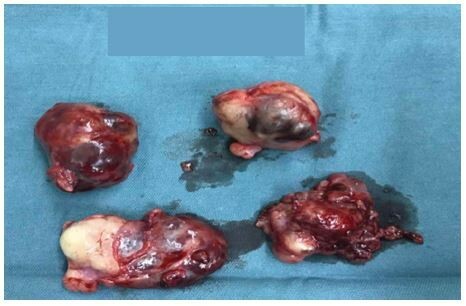 After cytoreductive surgery, three cycles of bleomycin, etoposide, and cisplatin were administered. Four years after chemotherapy, the patient experienced relapse. After the secondary cytoreductive surgery, no further treatment was performed. She is in good condition, ~19 months after secondary cytoreductive surgery using hormone-replacement therapy without chemotherapy. Some cases of ovarian ependymoma can be treated with surgery alone without chemotherapy and the outcome has been satisfying. Choosing treatment based on malignant ovarian germ cell tumors may be not optimal. Therefore, we suggest individualized treatment for ovarian ependymoma.